DID ANOTHER MAN KILL JEREAN BLAKE, 17, BEFORE POLICE KILLED AIYANA JONES, 7, IN 2010? Families grieve for Aiyana Jones and Jerean Blake on Facebook pages. 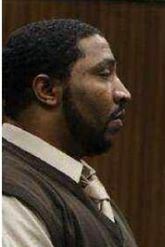 DETROIT – An alternate theory of the killing of Jerean Blake, 17, in 2010 emerged from testimony during the second and third days of the first-degree murder trial of Charles Jones, father of Aiyana Jones, 7 when she was killed by Detroit police, and Chauncey Owens. It was accompanied by several contradictory accounts of the events. It was not Owens, but his brother Sh’rron Hurt, nicknamed “Chinaman,” who shot him to death, according to an eyewitness description and an alleged statement from an acquaintance of Hurt’s, now in prison, detailing what Hurt told him about the case. Sh’rron Hurt is at left talking to witnesses James Liddell (in red) and Sylvester Bell, along with police officer in center, during lunch break at trial. 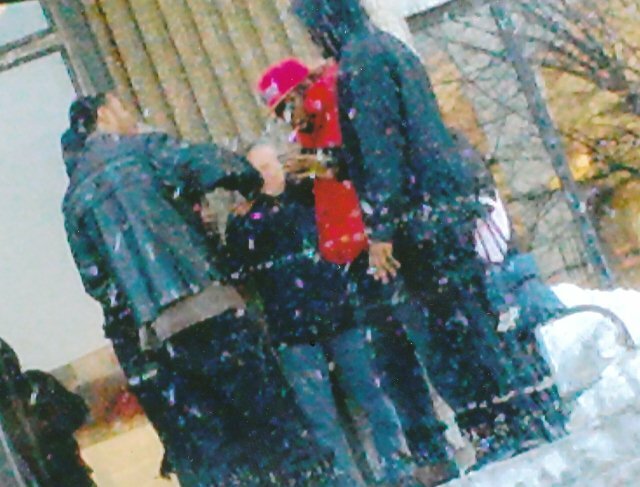 Bell and Liddell were presented as neutral witnesses, but appear to have been quite comfortable with Hurt and police. Bell testified that the officer told him he had done “a good job” on the stand. Liddell and Bell said they identified Chauncey Owens as the killer. Hurt testified that he drove a moped, with his “best” or “good” friend named “Chris,” whose last name he said he did not know, to the parking lot where Blake died. All witnesses have said a second moped accompanied a moped with one man on it to the scene. Hurt said he put his moped inside the lower flat of his house and called his wife to come get him to take him to his other residence in suburban Centerline. He said he was speaking with two men in a black car in the street when Owens and Jones arrived. “Isn’t it a common thing, that when you get in trouble, you go to Centerline?” Owens’ defense attorney David Cripps asked Hurt, who denied that was the case. Cripps asked if he put the moped inside to hide it, and whether he gave his weapon to the two men in the car. Hurt denied that description of events. 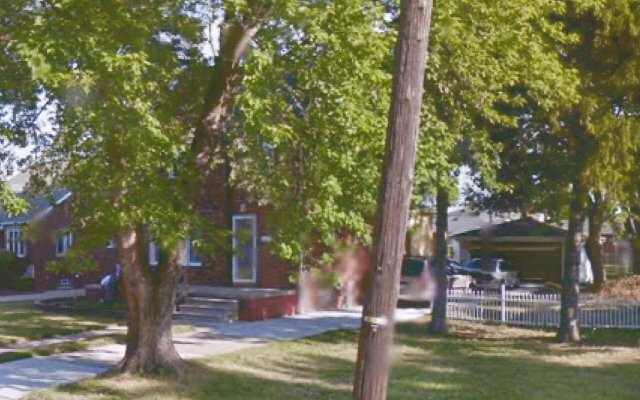 Sh’rron “Chinaman” Hurt alternated between this home in Centerline and his flat across the street from the Jones family on poverty-stricken Lillibridge, according to internet records. Hurt identified Charles Howard from a prison photo and said he knew him, but had not seen him for months. Hurt again denied the allegation. Hurt said he turned himself in to police the morning of Aiyana’s death after hearing from others that he was being sought in the case. He said police showed him a video of Owens’ interrogation and told him Owens had identified him, and that he was angry and hurt that he would do so. 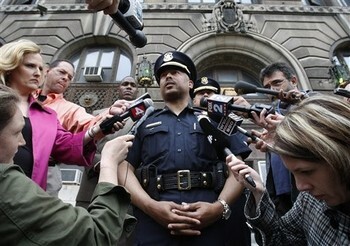 Former assistant police chief Ralph Godbee addresses media about Aiyana’s killing on May 17, 2010. Mayor Dave Bing barred any further use of reality TV camera crews after the raid, but never met with the Jones family to express his condolences. In fact, court records earlier reviewed by VOD show that police coerced Owens into NOT identifying his brother, after Owens found out that Aiyana had been killed during the events surrounding his own arrest. Prior to that discovery, Owens denied any knowledge of the killing. He later pled guilty to second-degree murder with a pledge in writing to “tell the truth,” which has been taken by the daily media to mean that Charles Jones gave him the gun to kill Blake. But Owens refused to testify against Jones during Jones’ preliminary exam a year and a half after Aiyana’s death, and the prosecution withdrew his plea deal. Community members futilely protested the opening of a liquor store so close to Southeastern High School, shown here. Shortly after Hurt’s testimony, Devon Lawson, now 21, a friend of Blake’s from Southeastern High School, testified that it was the driver of the moped with two people on it who argued with Blake and later shot at him. Lawson said Blake bumped into the man, who he did not know. He called the driver “Chauncey Owens” at one point, but said he knew that name only from news reports. He said a “coppertone” Suburban truck entered the lot about four minutes later. 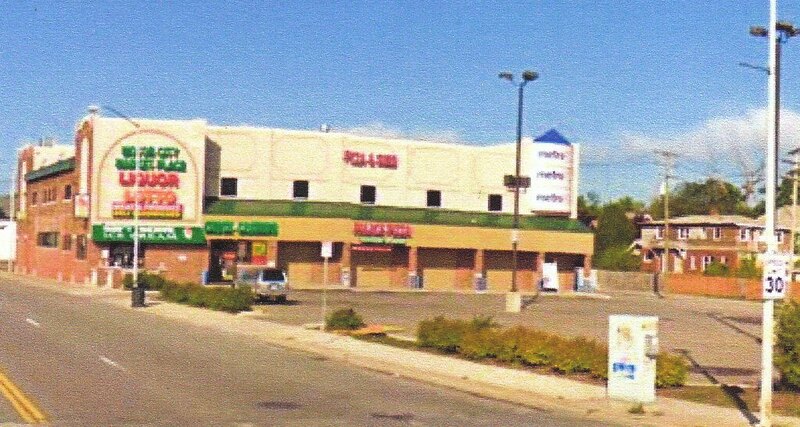 Mike’s Motor City Marketplace, site of Jerean Blake’s killing May 14, 2010. He said the shooter had been on the moped with two men on it, both of whom he said came back in the Suburban along with the other two individuals. Other witnesses have testified adamantly that the shooter was Owens, the man by himself on a moped, even pointing him out in the courtroom. However, they have given different descriptions of Owens. Blake’s classmates testified Jan. 28 that the shooter had braids, with one testifying that he had a mustache and goatee (which Hurt does have). Owens’ fiancée told VOD she had lived with him for 17 years, and that he never wore braids or a beard. Witnesses have also testified variously that only the driver got out of the truck, or that all those in the truck got out. They have said the shooter wore a white T-shirt or an orange shirt, and had on either a “do-rag” or a baseball cap. 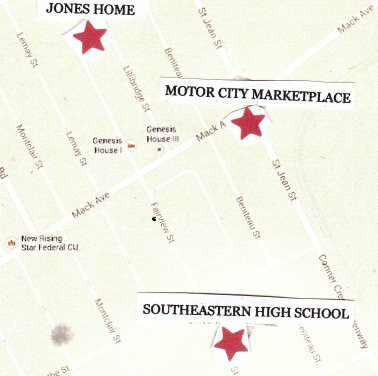 Sites of Aiyana Jones and Jerean Blake’s deaths, close to Southeastern High School. Two witnesses, Sylvester Bell and James Liddell, who testified on the second day, adamantly identified Owens as the killer from the stand. The two said they were at Bell’s father’s office next to the liquor store after getting off work. They said they picked Owens out of a photo line-up in which he has very short hair and no beard. They said they did so the day after Blake’s killing, while they were at their construction jobsite, and while a cameraman from “The First 48” TV show recorded the events. Wayne County Circuit Court Judge Richard Skutt, who is hearing the case, said he would issue an order for “The First 48” representatives to produce the relevant audio and/or videotapes. The presence of the cameramen was unknown previously to them, both the prosecution and defense attorneys said. 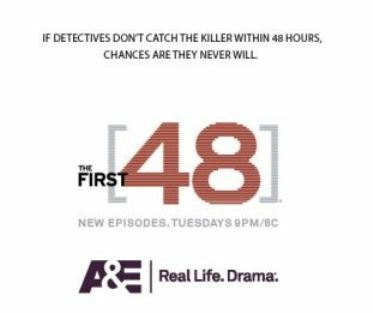 Was Detroit police rush to catch ANYONE in Blake killing due to A & E’s slogan? Another classmate of JeRean’s, Amber Holloway, now 19, was the final witness this week. She said she was in a car with Blake and three others, driven by Jacquavis Richards (J-Roc), when they went to the store. She said she saw Charles Jones in the front passenger seat of the truck, from where she sat in the front passenger seat of Richards’ truck. She said she first recognized him when she saw a television news report showing Jones after his daughter’s death at a press conference, and told her mother she recognized him. She pointed to Jones in the courtroom, although he has gained as much as 60 lbs. since that time and looks much different. She said she picked Jones out of a line-up 11 months after the incident. Contradicting testimony given earlier by Richards, she said repeatedly that the truck was parked in a space right next to Richards’ car, with Blake sandwiched in between the two vehicles. Richards testified earlier that the truck had pulled into the parking lot so that its back was behind the back of his car, and that he could only observe people exiting the truck by looking through the passenger side rear view mirror of his car. After his testimony, Richards and other classmates of Blake’s sat with his mother Lyvonne “Coolamama” Cargill in the audience. Cargill has repeatedly claimed adamantly on her Facebook page that Owens and Jones murdered her son. She was not at the scene and admitted during her testimony that she originally told police “some kids” at the scene identified someone named “Scooter” as the killer. 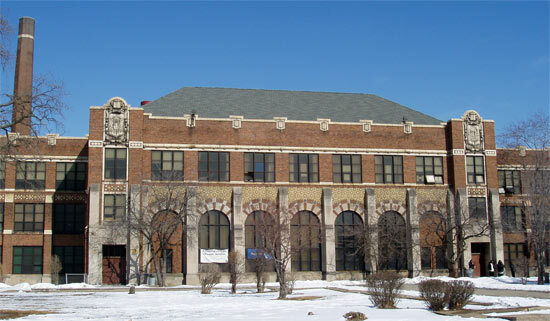 This is the photo originally used by the Detroit News with story on the deaths of young people in Detroit. 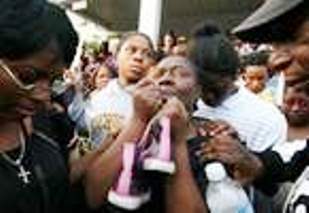 Taken by an amateur photographer, it shows Aiyana’s grandmother Mertilla Jones clutching the child’s tennis shoes during a vigil after her death. She has aimed bitter acrimony not only at Owens and Jones but at the entire Jones family, during a multitude of radio talk shows and on Facebook. A Facebook site called “Justice for Jerean Blake” recently claimed that the Detroit News originally ran a photo of Mertilla Jones and her granddaughter Aiyana with a recent article on the rampant deaths of young people in Detroit. It said Cargill called the News to complain, and they replaced it with a photo of herself and her daughter taken at the courtroom. That photo is now, however, a photo of Cargill sitting next to Richards during trial proceedings. Richards has his face covered as if in grief, but it is also possible that he did not want his picture taken. It is unusual for news photographers to take photos in the audience during a trial. 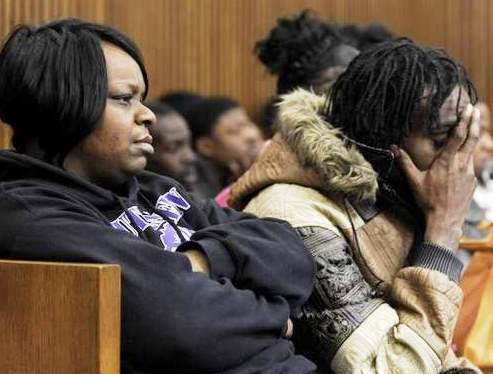 Jerean Blake’s mother is shown sitting with Jerean’s friend Jacquavis (J-Roc) Richards during trial in this Detroit News photo. Whether Weekley’s gun “accidentally” went off is still in question, as is the guilt of Owens and Jones. Weekley’s trial on manslaughter charges last June ended in a hung jury and he is presumably still to be re-tried. His jury had only one Black member. Two juries, one for each of the defendants, will have the final say in the Owens/Jones trial, during which numerous instances of “reasonable doubt” have evidently emerged. In a change from the juries usually picked in the Third Circuit Court, both juries have substantial African-American representation. Owens’ jury has four Black women, two Black men, five white men, and three white women. Jones’ jury has four Black women, two Black men, three white men, and five white women.